My plans for the weekend didn’t involve any Leamington parkrun-ing in England. Oh no, the plan was to drive up from Andover on Friday evening and then go tick off another Scottish run on the Saturday. Thus becoming one step closer to becoming a regionnaire. Unfortunately a small stone had another idea. While I was trundling along the M40 heading north a small piece of rock decided that what it really, really wanted to do was head south at high seed and embed itself in Mabel the Camper’s radiator. This led to a rapid water losing, fault light illuminating, engine overheating shuddering halt on the hard shoulder. I knew I was probably stuck until Saturday before I could do something about the van so I did what any self respecting pakrunner would do. While I waited for the recovery truck to arrive I checked out where the nearest run was. English park runs start at 9 !!!!! The recovery bloke dropped the van off in the middle of Warwick at a nearby garage where a peaceful night was spent listening to the locals on their way to and from the pubs and clubs. No pubbing or clubbing for me though. 8AM the next morning I was up and atem. 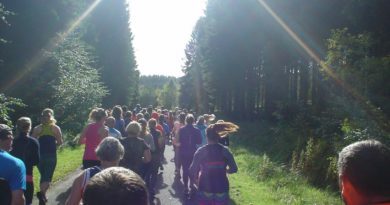 I headed off in the direction of Newbold Comyn park for my first English parkrun experience. The 5k run from where I’d left the van took a while as it was interrupted by various phone calls as I tried to resolve the issue of my still broken van. Plenty time, I’d be there with an hour to spare. Unless English park runs start at 9 instead of 9:30. Some slight confusion did arise on the road there, as I passed a running group heading in the opposite direction. A quick check of the map convinced me that I was going the right way though, they must not have been parkrunners. Strange people. The park itself is quite big with plenty of parking for those who’s vehicles weren’t sitting leaking water at the side of the road. There was the usual panic when I couldn’t see anyone hanging around when I got there though. Luckily there was a nice chap in a blue hi-vis (a Persil advert) who pointed me in the right direction with a cheery “I’ll see you half way round”. Well that sounded better than “I’ll see you at the top of the bloody big hill”. I made my way to the football clubhouse which serves as Race HQ and found over 600 folk who were clearly all hiding from me :). It was a chilly morning so the pre-run coffee in the clubhouse was most welcome. As was having somewhere warm to get changed. The first order of business was the first timer’s briefing which explained the course. Here it was basically one big lap, starting and finishing on the football pitches. There were quite a lot of Leamington first timers there and as it was a bit chilly we were all keen to get going. After the first timers briefing (where we were promised there was only one hill) the full race briefing followed. 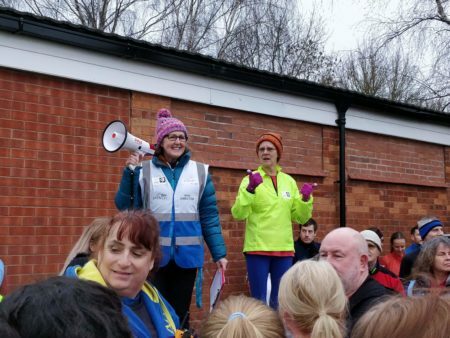 This was the first time I’d seen the briefing also given in sign language.. just making the whole parkrun experience just that little bit more inclusive. 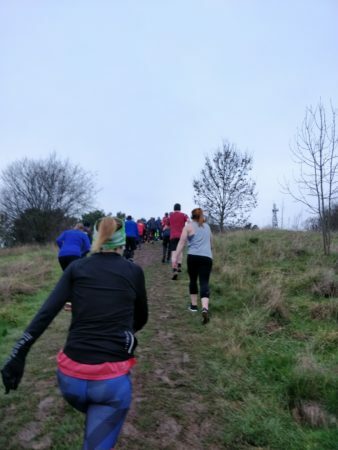 Looking around I saw there were also quite a few parkrun tourists in attendance, all sporting their cow cowls and cow bobble hats with pride. My cowl awaited me in Edinburgh, having completed my 20th different UK run the week before at Perth. The briefing had a few really nice touches I’d not seen before. Apart from the sign language there were also special running vests for folk who were completing their milestone runs (50, 100 etc), kids doing their 10th and anyone running on their birthday. There was one potential spanner in the works though. A gate half way round the course that had a new padlock on it… and no one had the key. Takes more than that to stop a parkrun though, and an alternative route was quickly worked out. With the warning that “it may get a bit muddy”. Given the stresses of the previous 12 hours, for me this was very much a “just get round” exercise. There was still the small matter of getting home afterwards so I decided to take it easy so I took up my usual spot towards the back end of the starting throng and with a 3-2-1 we were off. The first couple of Km was on fairly narrow paths so I found a spot and plodded on. The weather had stayed more or less nice and the fact that this was a trail run was a nice change. About half way round we came to the hill, and also the locked gate. 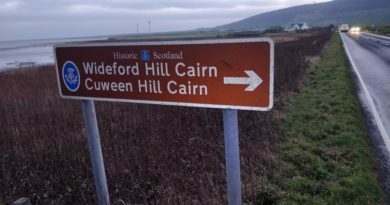 This meant that instead of running up a steep gravel path we took the alternative route up a steep, muddy, slippy hill. Thankful I was wearing my trail shoes. Some brave souls did try to run up this (with varying levels of success) but most of us walked until we rejoined the main path at the top of the steep bit. There was another uphill drag after we got there but after that it was, as promised, downhill all the way. After the lap was completed we arrived back at the football pitches and headed for the finish funnel. I checked my time and it wasn’t as slow as I’d expected. I still think that good scenery helps for a good time. That and sometimes you just end up getting swept along by other runners and going with the flow. On the way round there had been official photographers too, snapping away. Persil sponsor parkrun and today there was the chance to win a years supply of detergent if we caught the judges eye. 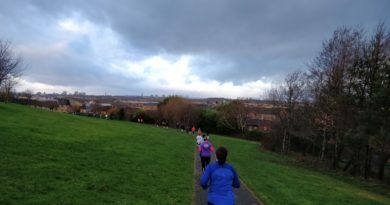 The sponsorship deal also meant everyone got a packet of laundry capsules, probably to get the mud from that bloody hill out of their running gear. The finish funnel saw the team try an experiment to try and get folk through more quickly. Now how long do you think it takes to collect your finish token from the token-giver-outer? Well even if it’s only a couple of seconds, there are 650 couples of seconds to get through. This time as we walked through the funnel we were told to hold out our left hands and the token wold be placed on our palms. Apparently they’d tried it at Bushy and it made quite a difference, and here it did seem to keep things moving along more smoothly. Little changes, big difference. Those little savings will build up as the number of participants continues to grow. 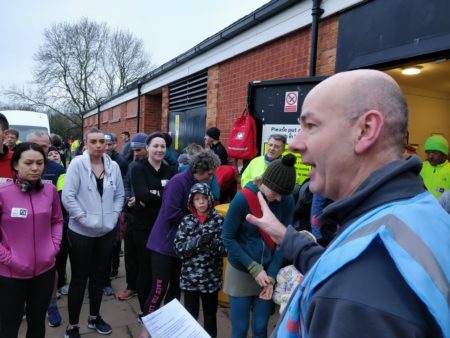 Although the stop at Leamington parkrun wasn’t exactly planned, it turned out to be a real gem of an event. Of the bigger runs that we’ve done this was definitely one of the best. OK, there were 650 people there but it still had the friendly atmosphere I usually associate with smaller events. The Ladies are in the football clubhouse. The gents are (apparently) round the back but I didn’t check them out on this visit.